PENANG: All rooftop telecommunication structures on residential buildings in Penang have been banned with immediate effect. With the ruling, the existing rooftop devices, numbering about at least 50 in Penang, will have to be dismantled. However, those sited atop commercial and industrial buildings are allowed with consent from the owners. MUST GO...a mobile phone transmission towers on top of a residential block in Batu Lancang in Penang. In announcing the decision yesterday, state Local Government, Environment and Traffic Management Committee chairman Dr Teng Hock Nan said both the Penang and Seberang Prai municipal councils had been directed to enforce the ban with immediate effect. He said the state exco decided at its meeting on Wednesday to adopt the Housing and Local Government Ministry guidelines which did not allow the installation of rooftop telecommunication structures on residential buildings. “Both councils must take steps to ensure the decision is complied with immediately by telecommunication companies,” he said in a statement. 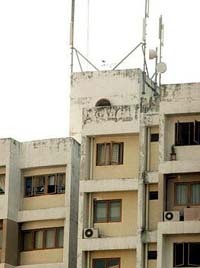 Most of the rooftop transmission devices are located atop shophouses and buildings in the city and the outskirts. On Sept 16, the Consumers Association of Penang claimed that studies around the world showed that persons living within 200m of telecommunication structures have a higher chance of developing health risks. Last month, the Penang Municipal Council directed a building owner in Kuantan Road to dismantle the rooftop transmission structure following complaints of health problems by nearby residents. Dr Teng said the state exco had in March approved the installation of rooftop transmission structures on residential buildings provided there were no objections from resident associations, developers or management corporations. On Sept 28, Housing and Local Government Minister Datuk Seri Ong Ka Ting directed all state and local authorities to adopt the ministry’s existing guidelines on rooftop telecommunication devices. He had also reiterated that all telecommunication transmission towers (those rising from the ground) must be located at least 150m from residential homes. Dr Teng said the ministry guidelines only prohibited rooftop transmission structures on residential buildings and not on commercial and industrial buildings unless with the owners’ consent. He said in view of public concern, State Public Works, Utilities and Transportation Committee chairman Datuk Koay Kar Huah had been directed to work with the relevant federal ministries to come up with a new set of guidelines, if necessary, governing telecommunication transmission structures in Penang. Meanwhile, five major telecommunication companies have assured the public that the installation of their transmission structures complied strictly with the permissible radiation and health guidelines. In a joint statement yesterday, the operators said the guidelines, based on the international practices and standards, were enforced by the Malaysian Communications and Multimedia Commission and outlined in its Regulatory Framework on the Sharing of Radiocommunications Infrastructure. The five are Celcom (M) Sdn Bhd, DiGi Telecommunications Sdn Bhd, Maxis Communications Bhd, Telekom Cellular Sdn Bhd and TIMECel Sdn Bhd.